In just a few short years, Bet9ja has become one of the most popular websites in all of Nigeria, owing in no small part to its promotions, betting selection and sponsorships. Discover why it has gained such a loyal following in our comprehensive review. Launched in 2013, the popularity of Bet9ja in Nigeria cannot be understated, with only Google being a more visited site in its home country. They are a household name there, organising marathons, sponsoring football teams and even reality TV shows. Their name can be found everywhere and, based on how many visitors the site receives, it’s clear that Bet9ja’s marketing tactics are working. As you enter the site, you’re greeted by a friendly face and the promise of a 100% bonus, not to mention a clearly well put-together website that oozes the level of confidence that you would expect from a brand with this kind of recognition. But as we look deeper into the operator, does the hype match up to the website itself? Here, we’ll be taking a look at whether Bet9ja truly does deserve its place as Nigeria’s premier betting site. Well, this is a rather tricky one because despite the 100% welcome bonus being clear to see on the homepage, it actually took us a very long time to find the details of the promotion. Considering how well the site is otherwise designed, this is a disappointment. We actually stumbled upon it through the deposit and withdrawals information page, and can see no obvious way you would find the terms and conditions via the homepage. Nonetheless, it is generally good news, with a reasonable wagering requirement of 10x on any sports betting market. However, the other promotions advertised – of which there are several – remain elusive in their details. At this point, we can only reasonably say that the terms and conditions for the welcome bonus appear good, but we do not have the details available to assess the rest. 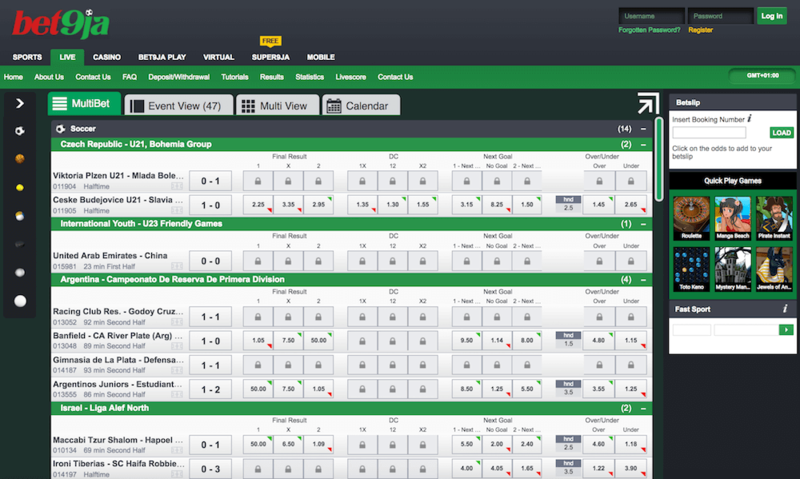 We’re moving onto something much more positive now with the betting markets. 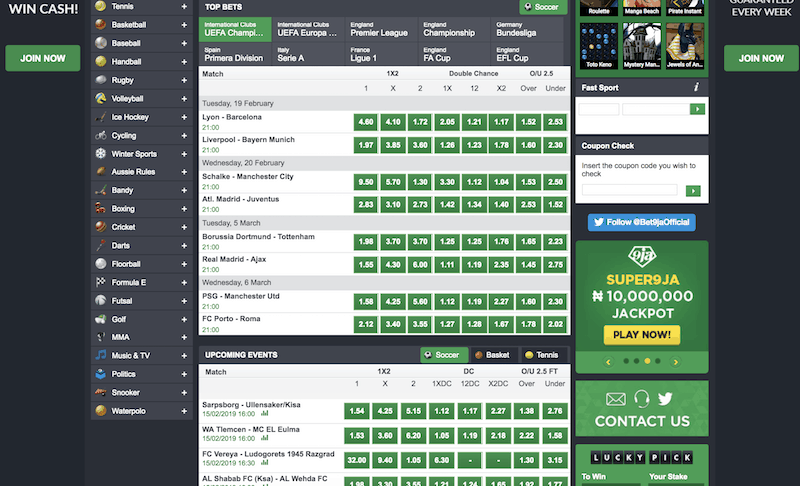 Bet9ja is a big name and it has a big betting selection to back that reputation up. Here you’ll find a huge amount of sports options. This includes all the obvious picks such as soccer, tennis, baseball, rugby, basketball and so on, being accompanied by less popular sports and even left-field options like politics, music and TV. The only thing really missing here is e-sports, which are a glaring omission. However, with so many different sports and different leagues within those sports – there are multiple international and national options related to soccer, for instance –, alongside a worthwhile virtual sports section, we would say that for the most part, Bet9ja excels in this area. Yet again, we have more positives here, as Bet9ja does indeed have a mobile app. In fact, it has two, as you need to download both the sportsbook and the casino apps separately. However, considering how well things work after this fact, we don’t think this minor inconvenience will phase too many users. You can play a massive range of casino games, manage your account – including depositing and withdrawing funds –, as well as bet live on thousands of sports from your mobile or tablet device. Their slogan for the mobile app is ‘bet anywhere, bet anytime’ and we think it pretty much lives up to that promise. Once again, there’s the promise of additional bonuses here but, sadly, we lack the required information to make a fair and decent assessment of them. With live betting being such a huge part of Bet9ja, you’ll be pleased to know that live streaming is as well. There are dozens of events available every day which benefit from an animated live stream. This means that, while you can’t quite watch the action as it unfolds, you can get a good impression of what is going on in real time and adjust your bets accordingly. Plus, if you just can’t get enough of watching while you bet, then be sure to check out their excellent virtual sports section. This includes football, tennis, horse and dog racing, each with several events to choose from. This really is one of the best examples of virtual sports we’ve seen with excellent video and great details, including a live virtual sports league table. While we have criticised Bet9ja for being unclear in other areas, that is thankfully not the case with deposit and withdrawals. There is an easy to find deposit and withdrawal section on the site featuring almost all of the information you could possibly need. With a dozen deposit options, we couldn’t possibly go through all of the details here but they include pretty much everything you could expect from a Nigerian casino, and the minimum and maximum limits are easy to see. All deposit transactions are processed instantly, while withdrawals are stated to take 24 hours. The only thing missing from this part of the site is information regarding fees, which can be found on the terms and conditions. These tell us that there are no fees for either withdrawing or depositing funds. This is, of course, good news but once again, Bet9ja occasionally frustrated us with making us search for what should be easy to find information. 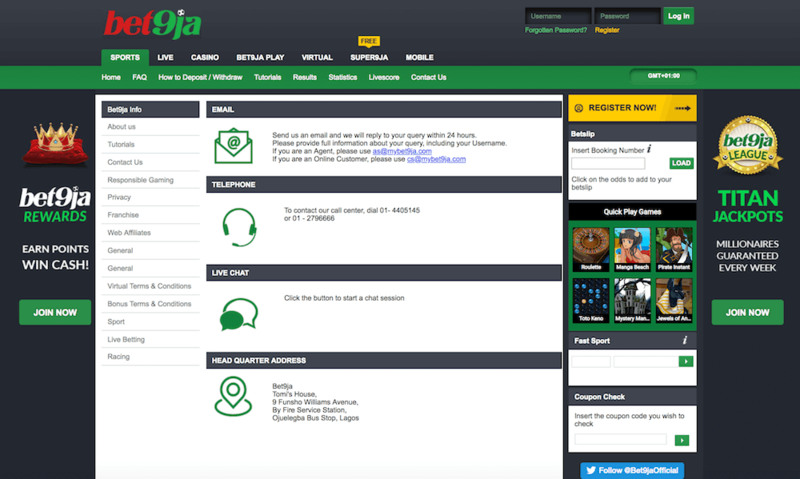 Unfortunately, the Bet9ja customer support can only be contacted through a call centre or via their Twitter. Obviously, neither is ideal and a live chat function would be much preferable, especially considering the issues we had with finding certain information on the site. Nonetheless, in our research, we have found that customers generally appear to be positive about their experiences with the customer service team, although we cannot verify any of that ourselves. Ultimately, this is an area which can use some improvement but could also be a lot worse. 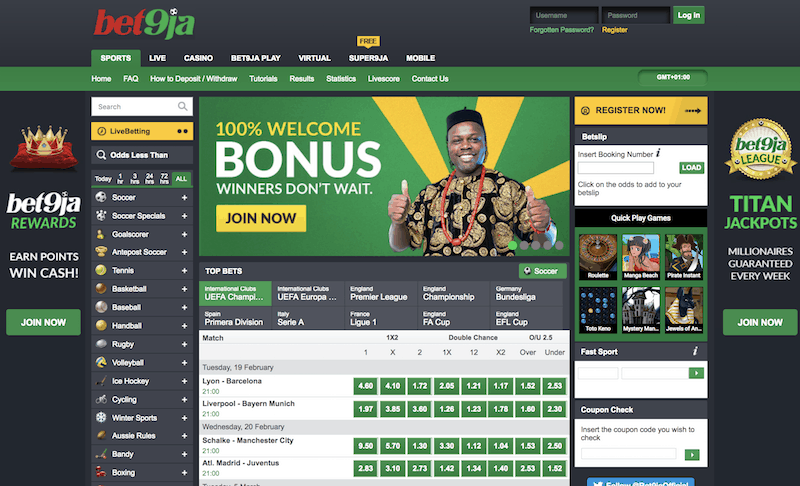 With an operator as popular as Bet9ja, there is a level of scrutiny on the site which is greater than its smaller competitors are subject to. This provides consumers with a certain level of trust and peace of mind that few others possess. They are licensed by the Lagos State Lotteries Board and have permission to operate in Nigeria. Alongside this, they were even in partnership with the Economic and Financial Crimes Commission in an anti-corruption marathon. It should be no surprise then that they have a good reputation regarding fairness and competitive odds. On top of that, the site also utilises SSL encryption to keep all of your sensitive data secure. Lastly, we couldn’t see anything regarding self-imposed deposit limits on the site. However, it does have a lengthy section on responsible gaming. 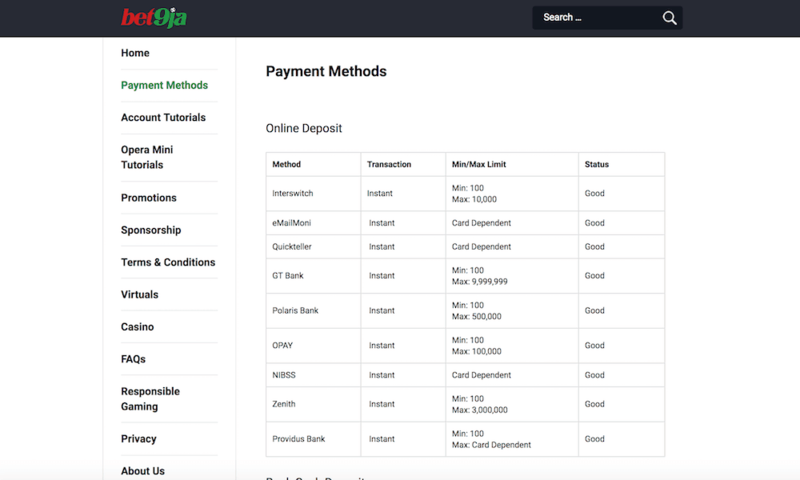 While there are certainly areas in which Bet9ja frustrated us – particularly when it comes to searching for specific information –, for the most part, it’s clear why it is such a success. The site boasts an excellent variety of sports and betting options, including one of the finest examples of virtual sports around. On top of that, its welcome bonus appears very generous: it’s just a shame we couldn’t verify the quality of its other promotions. The site design is attractive but it suffers from some minor issues here and there. However, none of that should massively hinder your average user. Overall, Bet9ja has a few wrinkles to iron out and considering its size, it should be more than able to do so. Even if it does not though, this is a website with far more good than bad.